Baking Soda or Sodium Bicarbonate is one of the most versatile ingredients in your kitchen. Everyone knows that baking soda is widely used in baking. But, very few know that uses for baking soda ranges from cleaning your home to improving your health. Baking Soda is a miraculous product with diverse uses. And it’s natural and inexpensive! It also has a rich history of being used as cleanser, soother, and deodorizer. Baking Soda is being actively used as an ingredient for cleaning various stuff. So having a box of baking soda at home is very useful and can make your cleaning chores very easy to accomplish. So have a look at the various amazing uses of baking soda and start implementing them from today itself! 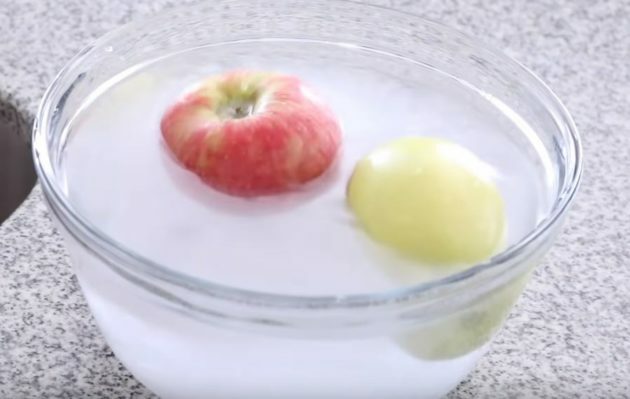 Make a mixture of water, vinegar, and baking soda. For skinned veggies & fruits like apple, gourds, etc pour the mixture into a bottle and spray it 5-6 times. Let it stand for 1-2 mins, then rinse with clean water and eat. For leafy veggies, soak them into the mixture for 1-2 mins. Rinse with clean water and eat. Hair Brushes and Combs are dirt magnets. Apart from catching surrounding dirt, they also catch dandruff, oil and other stuff from your hair every time you comb or brush your hair. If you don’t wash it regularly, these things go back to your hair and making them dirty. It is recommended to wash your comb and hair brushes once a week but if you don’t get enough time at least try to wash them every 3-4 weeks. Just soak them in a cup of warm water mixed with a teaspoon of baking soda and some shampoo for a few hours. Baking soda will act on the dirt and oil to make your comb and hairbrushes clean again. You can easily restore the shine of tarnished silver by following these steps. This works only for original silver cutleries or ornaments. 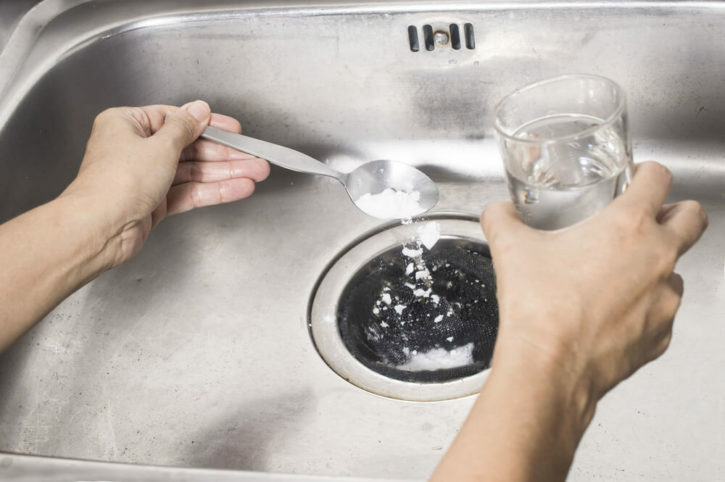 Boil 2 cups of water, add 2 tablespoon baking soda and a pinch of salt along with an aluminum foil. 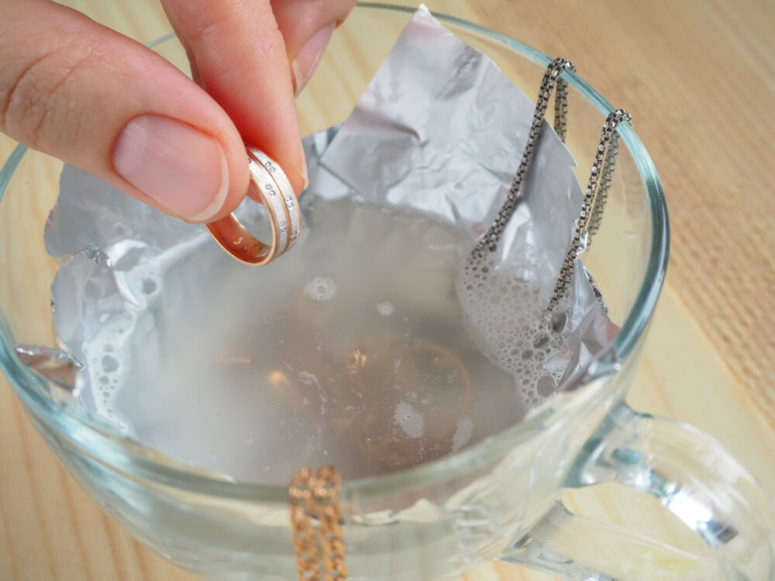 Take the silver items and dip them in water mixture and wrap them in another aluminum foil. Keep’em in foil for 15-20 seconds. Your tarnished silver items will regain its shine easily. Having good oral hygiene is extremely important. To maintain good oral hygiene, it’s important to clean your oral appliances like toothbrush, retainers, and dentures from time to time. Since they go in the mouth, the last thing you would want is to clean them using chemicals. If you want to clean them naturally without chemical cleaners, just add 2 teaspoons of baking soda in a cup of warm water and soak them in it overnight. Firstly, take the pan or pot you want to clean and fill it with water. Add a cup of vinegar and 2 tablespoons of baking soda to it. Let it sit for 8-10 mins, empty it and scrub the pan or pot with a scrubber. Still got some residue on it? Apply a paste made with equal parts of baking soda and vinegar where needed and scrub. Done! First, break and loosen the clog using a plunger. Once Loosened, pour a pot of boiling water down the drain. Now, put half to a quarter cup of baking soda and let it sit for 3-5 mins. Meanwhile, make a mixture of a cup of vinegar and a cup of boiling water. Pour it on the baking soda and let it sit for 5-10 minutes. Now Finish it by pouring one more pot of boiling water. You would also like these clever vinegar cleaning hacks. Add a cup of water in a microwave-safe bowl and mix it with 2 tablespoons of baking soda. The steam from water and baking soda mixture will deodorize the microwave and also loosen up caked stains inside the microwave. Done! Your microwave is fresh and clean again in just 5 minutes. It’s very hard to get rid of oil and grease residue left in Kitchen after cooking fried food. Just wiping them water and cloth won’t remove it. Follow these steps to get rid of grease stains from items in the kitchen. Sprinkle some baking soda on the item you want to clean. Spray some Vinegar on it to dampen the surface. When combined Vinegar and baking soda are amazing cleaning combo. Let it sit for 10-15 minutes, then Wipe down the greasy area with a damp sponge. Follow up by wiping with a clean damp cloth. Take 1/2 cup of vinegar and mix it with half a cup of baking soda. Add a tablespoon of hot water in the mixture. Mix it in water in place of chemical cleaner when required. Just take some baking soda on a clean and damp cloth to scrub the marks. Rinse and let dry, scuff marks will be gone. Follow the steps to clean tea and coffee stains using just baking soda. Firstly, dampen the stained surface. Sprinkle some sodium bicarbonate and scrub off the stains using a damp cloth. If that does not work, apply a thick paste of baking soda and white vinegar over it and let it sit overnight. Scrub it off in the morning. This is an amazing hack for your laundry in the list of baking soda uses. 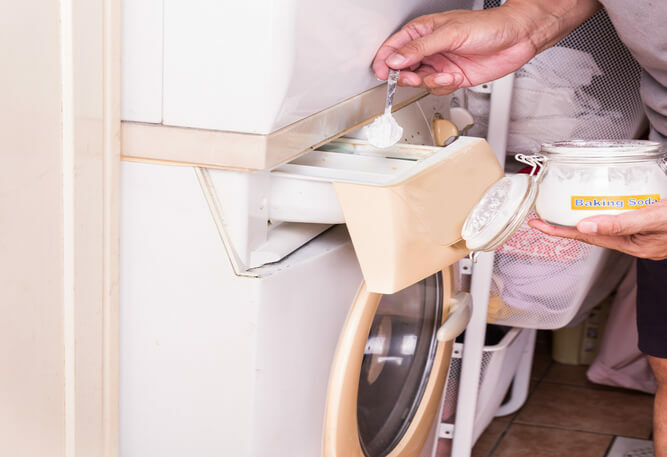 Adding a cup of baking soda to laundry will boost your detergent. Your clothes will be cleaner, brighter and fresher if use baking soda with detergent. You can also remove perspiration stains just by giving your clothes a baking soda pretreatment. How? Just rub baking soda and water paste on the stains, let it sit for 30-40 minutes and wash with rest of the laundry. Borax is also an amazing laundry booster. 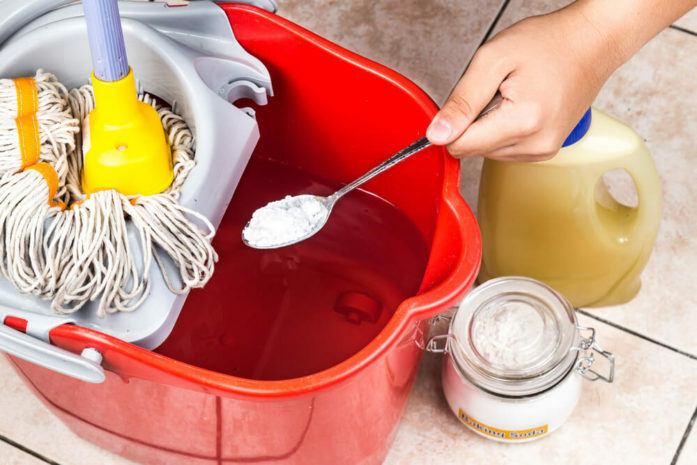 Check out these amazing borax cleaning hacks. You might be cleaning your carpet with cleaners available in the market. They contain harsh chemicals which can be harmful to your children and pets. 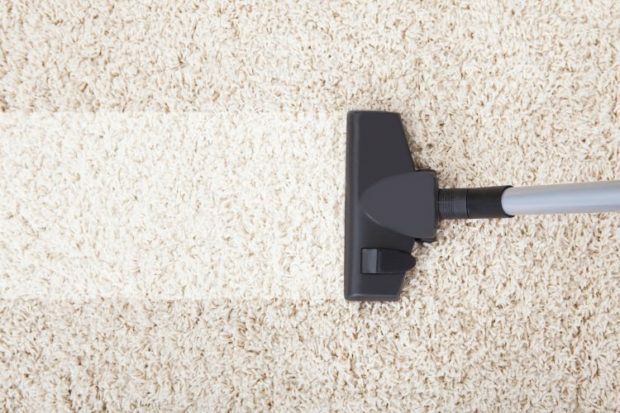 Why use them when you can use baking soda to make a natural and chemical-free carpet cleaner. Making it is this easy. Just mix 1 cup each of baking soda, water, and vinegar. Tada! Your carpet cleaner is ready. Vinegar works exceptionally well in cleaning and has some amazing cleaning hacks. Plastic containers tend to get stained from anything you store in them. However, you can easily remove stains from them using baking soda and warm water. Fill half the container with warm water, add 2-4 tbsp baking soda in it. Let them soak in the mixture for an hour before cleaning. Adding some amount of baking soda to the regular cycle of the dishwasher helps in eliminating unwanted grease from your pans and dishes and also easily remove baked-on food from ’em. After a certain time interval, sponges tend to smell like mildew. Baking soda is perfect to remedy to get rid of the smell and freshen up your sponges. Just mix 2 tablespoons of baking soda in half a liter of warm water, then soak the sponges in it for a few hours. This will eliminate the stale smell from overused sponges. If some food turns bad inside the refrigerator, it leaves a foul smell inside it for days and also ruins neighboring food by transferring the smell to it. Baking soda can be used to prevent this from happening. How? Just place an opened box of baking soda inside your refrigerator and freezer to help neutralize odors. Baking soda absorbs strong food odor, so they don’t change the taste and smell of neighboring food items. Replace it every 3-4 months, it may need faster replacing if it starts to absorb too many odors. Since your fridge is cleaned now, organize it with these brilliant fridge organization ideas. 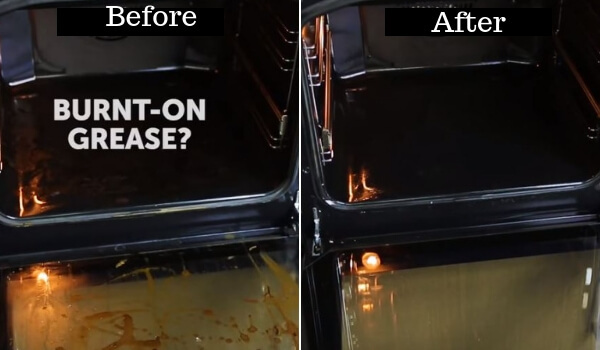 You can use WD 40 to get rid of carpet stains, WD 40 has some amazing hacks. Shoes tend to get smelly if not worn even for 2-3 days, especially in humid weather. Easily freshen up your shoes using baking soda, it is a great deodorizer. Sprinkle some baking soda in the smelly shoe and let it sit overnight. Dump out the powder before you wear and your shoes will smell fresh. Closet tend to smell musty after a certain interval due to humidity. Easy solution- baking soda! Just placing an open box of baking soda in the closet will help fight the odor and keep your clothes and closet smell fresh always. Trashcans can become too stinky sometimes. Although, a trashcan is always stinky. But you can neutralize the odor by sprinkling a layer of baking soda at the bottom of the trashcan and keep stinky smells away. Vinegar is also a great deodorizer, these vinegar hacks are a must know. Like the bathroom, a dishwasher can quickly begin to smell like mildew. You don’t want your dishes to smell of mildew. It’s easy to deodorize, you just need to sprinkle baking soda inside the dishwasher before cleaning every load of dishes. It also helps with cleaning. Is that old trunk smelling suspicious? Sprinkle some baking soda in the trunk, let it sit for some days and bid bon voyage to smells. Make sure to vacuum the trunk before using again. Removing onion and garlic odor from hand can be extremely tough. Sometimes it’s so bad that it does not get out even after washing hands with soap. However, washing your hands with baking soda and water can easily remove these strong odors from hand. In fact, you can deodorize almost anything in your home just by sprinkling some baking soda. The list to freshen up things around your home will never end if I cover everything. Sodium bicarbonate or Baking soda works great for plants and soil, it is a natural plant growth booster. Baking soda reduces the acid level of the soil. Baking soda makes a great pesticide. 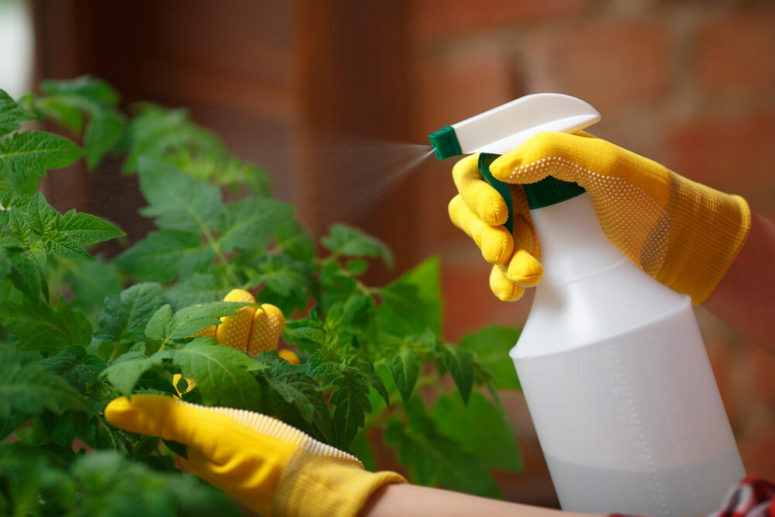 Make a spray by mixing baking soda, water and a small amount of olive oil to kill spider, mites, and aphids. It also prevents fungal disease on plants and can even kill slugs. You can also use Hydrogen Peroxide to get rid of pests, there are some amazing uses of hydrogen peroxide around your home. If your frying pan or stove catches small fire, just throw in baking soda and it will douse it. This works only in case of relatively small fire, if not, call 911. If you like the post, don’t forget to share it! 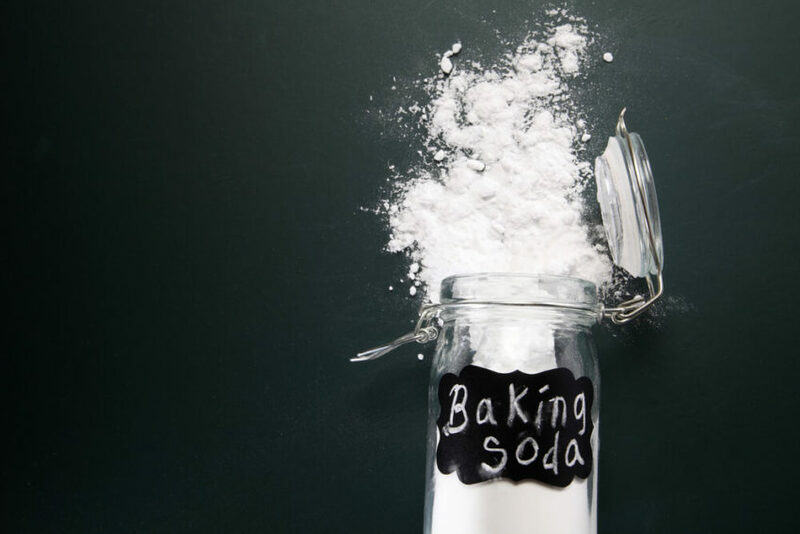 What’s your favorite use for baking soda? Try out these baking soda uses and let us know the results in comments below.